GN Oil Sludge Treating System is designed and manufactured to suit the demands of treating oil sludge particularly. System user manual includes every individual system’s manufacturing process, and system setup, operate, repair as well as disassemble etc. This system can treat waste oil sludge in multiple stages. It includes Air Compressor Unit, Vacuum Pump Transfer Unit, #1 Premixing and Heating Unit, #2 V-Tank Unit, #3 Shaker and Centrifuge Treating Unit, #4 Decanter Centrifuge and Disc-Centrifuge Treating Unit, #5 Disc-Centrifuge and Surge Tank Unit, #6 Gravity Oil/ Water Separator, #7 Micro Bubble Treating Unit, Chemical Dosing Unit and Auxiliary Parts such as walkways, guide rails and pipeline systems (includes electrical system and lighting system). Multifunctional design system, meet the demands of separating different oil/mud waste mud. System easily transport and meet transport and road standard within country use. 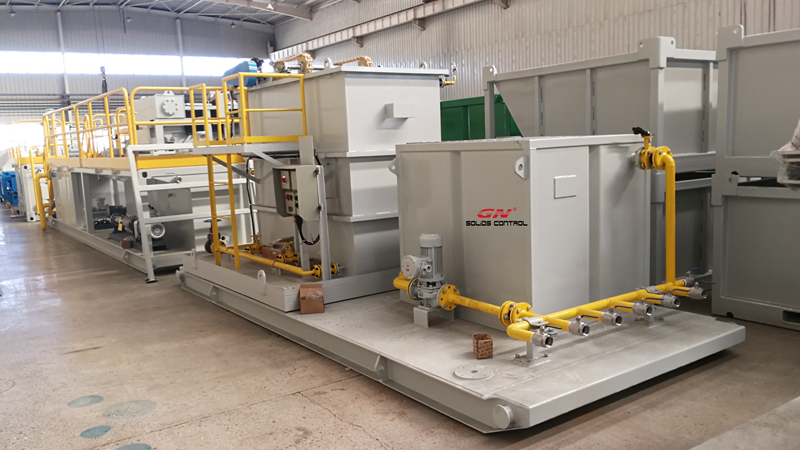 This system is using GN vacuum pump GNSP-10A to such the oil sludge and feed into 1# Premixing and Heating Unit, where sludge is diluted by mixing and heating before feeding into #2 V-Tank by submersible pump. 3.Design capacity：≤2 m3/h，rated capacity：2 m3/h. 5.Suitable working weather condition: rain, snow and fog. At the same time, clear water pipes, heating pipes and chemical pipes can add water, provide heat and chemicals to guarantee the treating performance.